Hudson Taylor saw many Chinese come to Jesus. Mr Nyi a businessman and a Buddhist, became a Christian after listening to a sermon on the bronze snake and Jesus' death and resurrection. He said it was the end of a long search for truth. A question he subsequently asked of Taylor is a reminder of the need for others to hear. Nyi asked Taylor how long England had known the gospel. Taylor: Several hundreds of years. Nyi: What! Is it possible that you have known about Jesus for so long, and only now have come to tell us? Oh, why did you not come sooner? This is not a scientific argument, it is a theological one. It is not saying anything about design but about the designer. The examples offered are usually not bad design but a problem with our ignorance. We don't understand the design. If we understood the full function of the organ then the good design would be obvious. Features need to be considered together and not in isolation. It is not one aspect that is being optimised but several. As an analogy consider a car, an object that is designed. Pointing out why you think a car functions suboptimally does not prove the car is not designed, it says that you think the designer did a poor job. Not understanding how spoilers work does not mean their presence is poor design, rather it reveals good design when you becomes aware of flow dynamics. Designing for speed and crash safety are competing themes. The fastest car may be unsafe in a crash. The strongest car may be slow. A car may be optimal for speed, safety, space, and fuel efficiency; though not maximised for any single one of these features. I heard mention of inerrancy and infallibility of the Scriptures in a sermon recently. The speaker was defending infallibility though he is not an inerrantist. It would appear that these terms seem synonymous so perhaps some definitions are in order. Incapable of error in expounding doctrine on faith or morals. Inability to err in teaching revealed truth. True in any claim of fact. Without error, and free from all contradiction. "Fallibility" in theology is describing reliability, "errancy" is describing error. Inerrancy encompasses infallibility, that is if the Bible is error free then it is also reliable. Inerrantists are infallibilists. However one can claim that the Bible is reliable and useful for faith yet claim it contains errors of fact. Infallibilists may or may not be inerrantists. I claim the latter position is difficult to defend logically and scripturally, but that is not the intent of this post. During the sermon the position of inerrancy was dismissed in, what I consider, somewhat of a strawman manner. Inerrantists were portrayed as being somewhat simplistic and unthinking. The kind who say, "God said it, I believe it, that settles it." While people of that persuasion undoubtedly exist, this is not the zenith of an inerrancy apologetic and one should should consider the best claims of his opponents, not the poorest. I am an inerrantist because I think that is the position Scripture points to. The Bible does not appear to discriminate between facts of faith and facts of history. Conversely the Bible claims to be grounded in history. We can believe God about things we cannot know because he is reliable in the things we do know. The early Christians backed up the truth of Christianity by appeal to a fact of history: the resurrection of Jesus Christ. Now we can know much about the spiritual implications of Jesus' death and resurrection based on revelation by God, but this revelation is confirmed in our minds by the very fact that Jesus did indeed die and then rise from the dead! Many people make claims about spiritual truths but many are also unreliable. They cannot back up their claims with events that prove them trustworthy. If they are unreliable in earthly things why should we believe them about spiritual things. But rather than an extensive defence of inerrancy at this stage, I want to describe what it is inerrantists claim. Inerrantists believe the Bible to be true in every factual statement it affirms. Inerrantists can agree with the quote, "God said it, I believe it, that settles it," though preferably with qualification. The debate is settled on the side of Scriptural claims because God never errs. The problem lies in the first clause. While true on the face of it, the debate is around what exactly did God say? The speaker is equating the Bible with God's words: written in the Bible = God said it. But Bible may not say what the speaker is claiming the Bible says. So while the inerrantist believes the Bible is true in everything it affirms, the careful inerrantist wants to know what exactly the Bible does affirm; nothing more, nothing less. While people may disagree on specific meanings of texts, there are several relevant issues in understanding Scripture. I will address the literalism claim in more depth. Inerrantists don't hold to a literal reading of every text. While they believe much of the Bible is to be taken literally (while errantists may not do so), probably the best descriptor of their hermeneutic is a "straightforward reading" of the text. So if the text is historical narrative then the claim of inerrantists is that what is written is a faithful history. The events really did happen in the way described. But this does not mean that every verse is to be read as literal. No one reads like this. Even the hyperliteralist sees metaphor in some passages. I am not aware that anyone claims the parables really happened. The literalist would rather defend that Jesus really spoke the parables. So Scripture is to be interpreted according to genre. Here are several beliefs that inerrantists can and do hold. Poetry uses symbolism and hyperbole. Proverbs are general truths and there may be specific examples of people who fail to follow the general rule. Fables and allegory illustrate an underlying reality. Analogies carry over an aspect common to 2 situations. They may carry over several aspects but they may carry over only 1 aspect and one should be careful about over reading them. People use approximations when giving information. Not all information about an event may be given. Early revelation is not overturned by later revelation though it may be clarified and/ or expanded upon. Only the original text is necessarily inerrant. Copists made errors. Extant manuscripts may contain error. Translation can introduce error. The original language is inerrant, other languages are inerrant in as much as they faithfully reproduce the original. The text may contain more than one meaning. A strict chronology may not be followed. The Bible may be (deliberately) vague in places. Prophecy is often difficult to understand, especially before the fact. Here are some examples that an infallibilist may falsely challenge an inerrantist. So where would an inerrantist and infallibilist possibly disagree? The numbers of returning exiles listed in Ezra and Nehemiah do not line up. Was the number of demoniacs 1 or 2? Jonah was not really swallowed by a sea creature. The chronology of the Israelite/ Judean kings is incorrect. Noah did not really live to 950. Paul did not write the pastoral epistles. An infalliblist may claim that there is error in the Bible as evidenced by this list, but because they are not claims of faith we can still learn from the principles in the stories. The inerrantist would argue that the straightforward reading of the Bible claims are indeed true or that the apparent contradictions are resolvable. He would further argue that the lessons taught are dependant on the reality of the situation: God acting in real history. is in order. 3 responses to my recent post, God's sovereignty and glory, while accurate, did not quite focus on what I was trying to say. It is not that I think God gives us some freedom and still retains his sovereignty, even though that is true. If freewill then not forced love. The nature of love means it is our decision to make. A couple of side notes. I am not saying freewill equates to being able to do or think anything. We cannot do many things. It may not occur to us to think of many things. We cannot process ideas that are beyond our comprehension. And God is able to act on our thoughts (give us ideas or prevent us thinking something); and on our actions, force or prevent a certain action. Freewill means the ability to make some decisions independent of God. We may make some of these decisions contradictory to God's preferences. And even though God cannot make us love him he can prove his existence to us and he can act in such ways as to maximise the chances that we will desire him. He can pursue us to depths unimaginable. I have been meaning to post on a paper by Christopher Monckton which discusses climate sensitivity. The article was interesting for several reasons. It was attempting to show that the climate models overestimate forcing by neglecting more significant attenuating factors. It was also interesting in that a disclaimer preceded the article which apparently was unprecedented and possibly incorrect. The paper is slightly difficult to read, I struggled with aspects and I am trained in physics. There are some interesting comments in between the mathematics. This does not necessarily mean the uncertainty of climate is high, it depends on how much influence these feedbacks have in the models. They may have negligible effects in predominantly solar models but are the major contributor to CO2 models. Which means the uncertainty of anthropomorphic climate models is high. Even satellite-based efforts at assessing total energy-flux imbalance for the whole Earth-troposphere system are uncertain. Worse, not one of the individual forcings or feedbacks whose magnitude is essential to an accurate evaluation of climate sensitivity is mensurable directly, because we cannot distinguish individual forcings or feedbacks one from another in the real atmosphere, we can only guess at the interactions between them, and we cannot even measure the relative contributions of all forcings and of all feedbacks to total radiative forcing. 20 different feedbacks and they cannot be empirically distinguished. How can the modellers even know whether these things exist? The IPCC’s methodology relies unduly – indeed, almost exclusively – upon numerical analysis, even where the outputs of the models upon which it so heavily relies are manifestly and significantly at variance with theory or observation or both. Modeled projections such as those upon which the IPCC’s entire case rests have long been proven impossible when applied to mathematically-chaotic objects, such as the climate, whose initial state can never be determined to a sufficient precision. For a similar reason, those of the IPCC’s conclusions that are founded on probability distributions in the chaotic climate object are unsafe. With the subsequent conclusion noting 9 serial contingencies; 9 nested if/ then statements! What motivated me to get around to this post is Monckton's publication this month (pdf), Hockey Stick? What Hockey Stick? How alarmist "scientists" falsely abolished the Mediaeval Warm Period. to such a degree that even if anthropomorphic global warming were a true phenomenon, the IPCC would be unable to discover it. I will add that I do not find the evidence for a medieval warm period given in the later half of the paper particularly convincing. I think there was a medieval warm period, but I am not convinced by the examples and methods he reproduces. The continuing affair of the “hockey-stick” graph is a microcosm of the profound collapse of the rigor, objectivity, and honesty that were once hallmarks of the scientific community. The need to look to the State for very nearly all science funding has inflicted upon the scientific community a dull, dishonest uniformity, so that the deliberate falsification of results to support the current official orthodoxy has become commonplace, particularly where the climate question is concerned. It was bad enough that one of those behind the “hockey stick” affair should have told a fellow researcher, “We need to get rid of the medieval warm period.” It was worse that the authors of the bogus graph attempted to do just that, by ignoring, undervaluing or even suppressing proxies for northern-hemisphere temperature that did not suit the result they wanted; by falsely stating that they had used data they had in fact replaced with “estimates” of their own that gave them a less inconvenient answer; by overvaluing by many orders of magnitude the contribution of datasets that suited the result they wanted. It was worse still that the IPCC, several leading journals and numerous former co-authors of the three fabricators of the hockey stick should have continued to cling to it as though it were Gospel even though it has been justifiably and utterly discredited in the scientific literature, and should have gone through an elaborate pantomime of rewriting and publishing previously-rejected papers with the connivance of a dishonest journal editor, so that an entirely fictitious scientific support for the false graph could be falsely claimed by the IPCC in its current Fourth Assessment Report. The IPCC might have regained some of the scientific credibility that it lost by its publication of the 2001 graph if, in its 2007 assessment report, it had had the integrity, honesty, and common sense to apologise for the failure of its soi-disant “peer-review” process to identify the multiple and serious scientific errors that led to the publication of the graph. Is there, therefore, the slightest reason for the childish panic that the environmental extremist movement and its servant the IPCC have attempted to whip up? No. Should any government devote a single further penny to the climate scare? No. Even if humankind is contributing significantly to warmer weather (which is highly unlikely), adaptation to warmer weather as and if necessary would be orders of magnitude cheaper than the measures to reduce carbon emissions that the world’s extremist politicians are now so eagerly but purposelessly advocating. The real cost of the flagrant abuses of the scientific method surrounding the question of climate that are so well illustrated by the affair of the “hockey stick” is a terrible, unseen cost in human lives. The biofuel scam that arose directly out of the climate scare has taken one-third of US agricultural land out of food production in just two years. Similar economic disasters have occurred worldwide, not because of “global warming” but because of the catastrophically bad policy-making that the “global warming” scare has engendered among politicians too ignorant of science and too lazy to do other than swim with the rising tide of pseudo-scientific nonsense. The environmental extremists, who have already killed 50 million children through malaria by their now-canceled ban on the use of DDT, the only effective agent against the anopheles mosquito that spreads the infective parasite, are already eagerly killing millions more through their latest scientifically-baseless scare – the “global warming” panic pandemic. Food riots are occurring throughout the world among the poorest of the poor in many countries: but the desperation, starvation, disease, and death that accompany the sudden famines that the biofuel-driven doubling of world food prices has engendered are scarcely reported by our news media. In Haiti, they are eating mud pies made of earth, water, a tiny knob of butter, and a pinch of salt; or they sell the mud pies to less fortunate neighbours at 3 US cents each. Has any Western news medium reported this, or the hundreds of other agonizing stories of famine and starvation all round the world? No. Instead, every icicle that falls in Greenland is paraded as an omen of imminent doom: and, as for the crooked pseudo-scientists who invented the hockey stick, supported it, and continue to parade it in the mendacious documents of the IPCC, no journalist would dare to ask any of them the questions that would expose their self-seeking corruption for what it is. These evil pseudo-scientists, through the falsity of their statistical manipulations, have already killed far more people through starvation than “global warming” will ever kill. They should now be indicted and should stand trial alongside Radovan Karadzic for nothing less than high crimes against humanity: for, in their callous disregard for the fatal consequences of their corrupt falsification of science, they are no less guilty of genocide than he. If the alarmists are right, then it is important to bring attention to these "omens." The issue may need to be addressed. But ideas have consequences. If they are wrong it is possible they have blood on their hands. 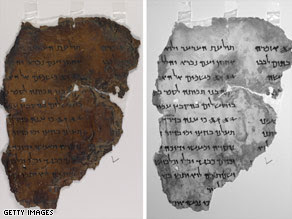 The Dead Sea Scrolls, at least the initial manuscripts, were found in 1947. Different groups were given the task of transcribing and translating the discoveries; probably a good thing given how long at least 1 group took. Reasonable quality photographs could have been made at the time the time of the discovery (and in fact were) with facsimiles distributed to interested parties around the world, but this didn't happen. If all the photos manage to be uploaded then hopefully interested groups will be able to create text files. Much of this may have already been done. These can subsequently be integrated into a database of various Bible manuscripts. This kind of open access resource could aid in creating a more accurate Old Testament text. Newer technologies allow photographing in other wavelengths. The image on the right above being an infrared image. This should help in clarifying hard to read passages. In similar news the Codex Sinaiticus is gradually being uploaded. Though photos of previous photos are already available online. Interesting article on global warming by Geoffrey Duffy, professor at Auckland University. He covers basic climatic factors, atmospheric composition, contributions of various gases to the greenhouse effect, solar effects, and oceanic oscillations. He also covers computer modelling of the climate. Unfortunately a lot of estimates and predictions are strongly based on theoretical computer models. Many now even trust models and their ‘theoretical results’ more than actual measurements and facts from reality. Computer analysis requires that the earth be ‘cut’ into small, separate areas (actually volumes), each being analysed for heat input/outputs and other gas/vapour fluxes. Even so the computational analysis domain size (basic computer grid elements) is huge, 150km x 150km by 1km high, with the current computer power. It is so large that the effects of even the very large clouds are not individually included; and that includes clouds in our visual horizon. The spatial resolution is therefore very poor. Supercomputers cannot give us the accuracy we need. Modellers therefore use parameters: ‘one factor fits’ all, for each of the domains (a kind of a ‘fudge factor’). This is sad, as water as vapour in clouds is 30 to 60 times more significant than other minute amounts of other greenhouse gases. Clearly climate simulations and thus predictions can be in serious error unless the actual cloud effects are well defined in the models. It is not only the number and spacing of the clouds in that 150 square kilometre area, but also cloud height effects, and cloud structure. These factors are not accounted for at all. Inadequate modelling parameters; and he doesn't even mention recent solutions to atmospheric equations which disprove runaway positive feedback. I am in agreement with much of the article in general with some caveats. I disagree with his comment about greenhouses creating heat. While strictly true, it is slightly misleading in the article. While the effect does dampen fluctuations, it also contributes to global temperature and alterations in atmospheric composition may mean a different global temperature. I do not have much time for ice-core data which he also mentions. The comment about water contributing to 95% of the greenhouse effect, is probably correct, but the interaction between water and CO2 and their relative contributions is likely a little more complex and difficult to elucidate. However if clouds are included with water (ie. water does not just mean water vapour) then the 95% may turn out to be an underestimate. He also discusses some of the consequences of the policies enacted. The panic to do something about climate change has led to some unrealistic and unsustainable actions. For example, Bio-fuels from grain will greatly increase food prices and roughly 30 million people are expected to be severely deprived. The USA will use up to 30% of the annual corn crop for alcohol production for vehicles alone. The problem with acting on errant beliefs is that there are always consequences, specifically negative ones. Worshipping the earth comes at the cost of hating the poor. Increased demand for grain may lead to increased supply over time which may ameliorate this. And fortunately some sense seems to be coming to European legislators whose enthusiasm for biofuels is dampening. The same cannot be said for New Zealand which passed new laws mandating the inclusion of biofuels. Often, people do not avoid the Bible, they just avoid you with a Bible in your hands.